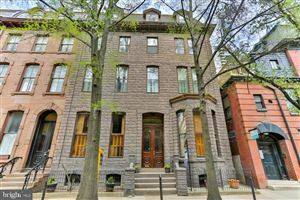 The 700 block of Chestnut Street is a block from Independence Hall and the Liberty Bell Center. Despite the prime location, the block hasn’t been living up to its potential and had several vacant retail spaces and a few run down historic buildings. A long parking lot is located at 709 Chestnut, next to the restaurant Union Trust, with a 10,000 square foot mural on one of the adjoining walls known as “Legacy”. This lot is owned by Parkway Corporation, which now intends to build an apartment tower on the site. This new tower is being designed by Erdy McHenry Architects. 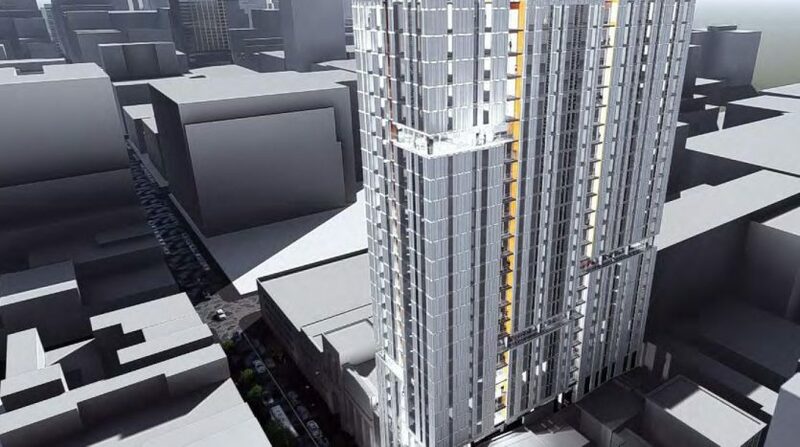 The new apartment tower at 709 Chestnut Street would be 27 stories, and 317 feet, tall. It will have different sections which would be separated with indentations and have different facades and terraces. The lowest level of apartments will have garden terraces. The facade will have large windows and metal panels. The roofline will be uneven and will have additional terraces. The tower will have 278 rental units and 135 parking spaces. The parking garage will be above the first floor and will have a modern mechanical system and screened by glazed windows. The mural will still be partially visible from the street. There will be a fitness center with an outdoor deck, a club room and lounge on the top floor and a green roof in between them. 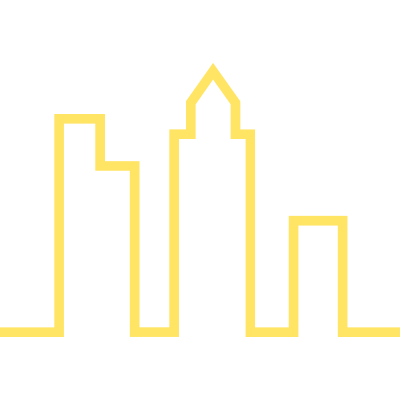 The area of Center City in between the Independence Mall and Broad Street is experiencing several new high rise developments. 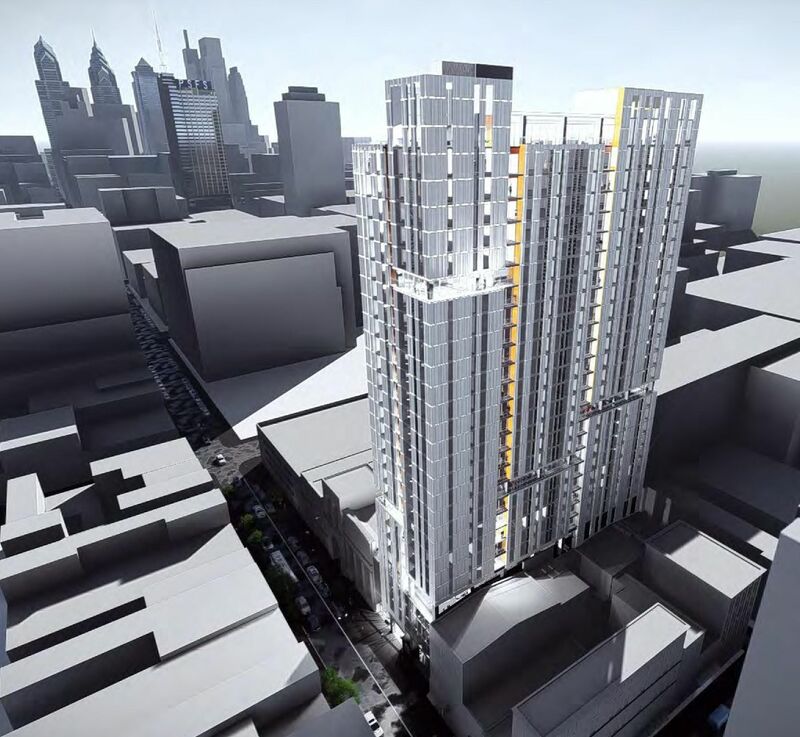 New apartment towers have been built at 1213 Walnut Street and the 1100 block of Market Street and new condo towers have and are being built at 500 Walnut Street and 702 Sansom Street. The new tower at 709 Chestnut Street will be another addition to this ever growing section of Center City.